Teebox - the golf accessory product that keeps you in charge... whether you walk or ride. Now on Kickstarter. Golf, more than most sports, is a game of focus and concentration; a stray thought or minor distraction can easily sabotage a stellar round. Whether you're on the cusp of clinching the club championship, or playing a casual nine with friends, it's always advantageous to eliminate those elements that take your mind off the task at hand... and for today's golfers there are many such elements. Take, for example, technology: though we have a myriad of innovative apps... GPS range finders, game trackers and scorecards... easily accessible on our phones and devices, the challenges of keeping them charged adds a layer of distraction no golfer needs. That's were Teebox comes in. Now available for funding on Kickstarter, this sleek golf accessory product serves as your golf organizer & portable phone charging station. Whether you're driving a cart or walking the course, Teebox keeps you powered up and focused. The thing is, it sits perfectly in your cart cubbies, but also fits easily in your bag... or in the basket of your push cart. Pockets for golf tees and divot repair tools... snacks, sunscreen, cigars and more... means no fishing around in your bag wasting time and focus. 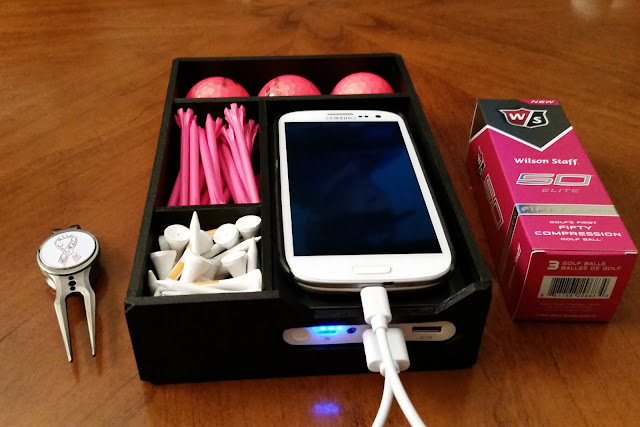 Best of all, this awesome golf organizer has a built in phone charging station. And its portable, so you can keep your device powered up no matter how you want to play... walking, pulling or riding (gas or electric). It's great for the range as well. There are tons of golf accessories out there but this really resonates with me. You see, I play with a variety of golfers, but whether it's the competitive ladies league or my husband and his hacker friends, our golf carts always seem to become a confusing jumble of... stuff. Very distracting. Then there was the time my phone found itself on the receiving end of an extra spicy Bloody Mary. Not good. The Teebox will keep your cart cubbies under control and your devices high and dry... and fully charged, without fuss. Have a look at Teebox in action on their Kickstarter video below and visit the Teebox Kickstarter page to support this fun project. I think you'll agree, it's a simple solution whose time has come.